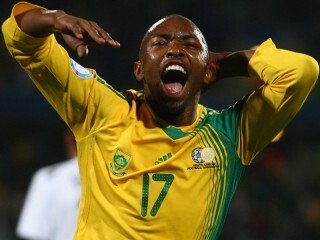 Bernard Parker (born 16 March 1986 in Boksburg, Gauteng) is a South African soccer midfielder/striker, currently playing for FC Twente in the Netherlands. A product of the School of Excellence, Parker made his debut in the professional ranks for Benoni Premier United. He remained in Durban with Thanda until early 2009 when he obtained a transfer to former World and European Cup Winners Red Star Belgrade in Serbia. In July 2009 he signed a double contract with FC Twente and now is under investigation of FIFA. If this proves right, Parker will face minimum 6 months of suspension. On 17 June 2009, he scored both goals in a 2-0 win over New Zealand in the 2009 Confederations Cup and also received the Man of the Match award.